Founded in 1982 by Sid Meier and "Wild" Bill Stealey, MicroProse Software was based in Hunt Valley, Maryland. Arguably one of the best developers of the '80s and beyond, the story of how MicroProse came to be is fairly well known. When retired military pilot Bill Stealey met Sid Meier, who was a programmer at General Instrument at the time, they played Atari's Red Baron game. Meier outperformed Wild Bill and claimed he could make a better game. Stealey offered to sell his game if he made it so Meier developed Hellcat Ace in a couple months and MicroProse Software was born. The developer released a variety of games though simulation titles were the primary focus, especially during its early years when it published F-15 Strike Eagle, Silent Service, and Gunship. Most of its game were only released on home computers during the '80s as it did not publish any console games until 1989 when Sega released its 16-bit Genesis. Around this time Stealey also bought out Meier though Sid continued his work for MicroProse as a private contractor. Other divisions within MicroProse included two I already posted ads for, Medalist International and MicroPlay, plus there was the internal development studio MPS Labs and its U.K. publishing branch MicroStyle. It also purchased Paragon Software in 1992, a company whose games it often published under the Medalist brand. Despite many hit games, MicroProse found itself in debt after a couple of failed arcade releases which led to it being purchased by Spectrum Holobyte in 1993. Under Spectrum Holobyte MicroProse released a number of popular games, including classics like X-COM: UFO Defense and Sid Meier's Civilization II. However, quite a bit changed after the sale of MicroProse as Stealey left the company to found Interactive Magic in 1994 and Meier started Firaxis Games with Brian Reynolds and Jeff Briggs in 1996. 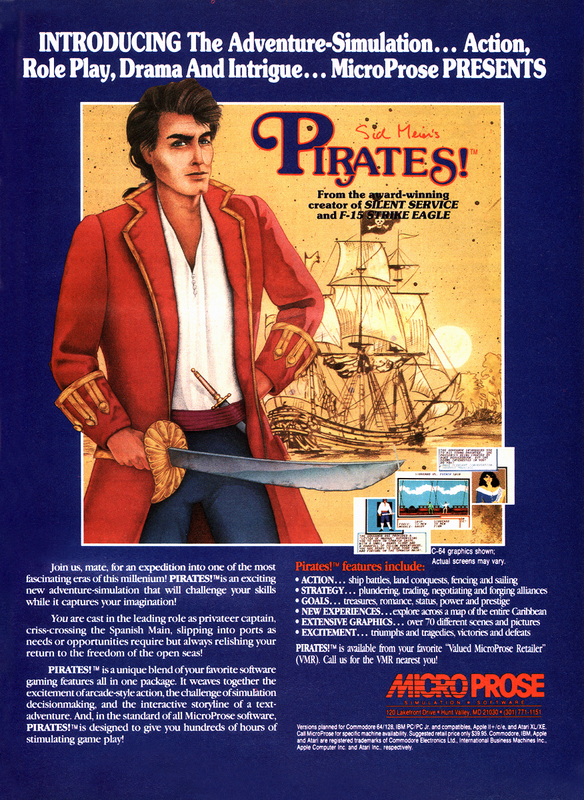 Hasbro Interactive acquired MicroProse in 1998 and after Infogrames purchased Hasbro Interactive in 2001 the MicroProse name was no longer used. It was an unfortunate end for one of my favorite developers as MicroProse is responsible for two of my top five games of all time in Sid's Meier's Pirates! and Sid Meier's Civilization II, and I'm quite fond of Airborne Ranger and Sid Meier's Railroad Tycoon too. In the ads you'll see a few that actually feature Bill Stealey which I think is great. It's rare to see ads with people that worked at game companies as any time a real person is shown it's usually an actor, athlete, or model.